One of the most fascinating tours that Transfers Corfu offers is Paxos-Antipaxos–Blue Caves sea cruise. 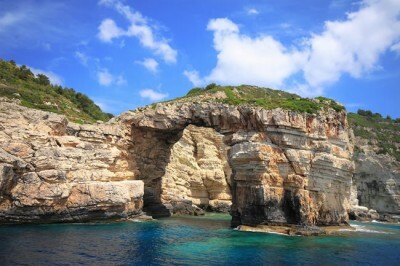 A unique cruise close to the southern coast of Corfu, to the famous islands of Paxos and Antipaxos. Our bus will be waiting for you outside of your Hotel at the time requested and you will be transferred to the harbor of Corfu to begin your sea cruise. Departing from the harbor your boat will be traveling towards to the south of Corfu island giving you the opportunity to admire the breathtaking scenery of the two Venetian fortresses, the palace of Mon Repos, the summer resorts Perama, Benitses, the village of Kavos and the cape of Asprokavos, to approach the channel between Corfu and Paxos. Sailing along way the Paxos coast,our cruise’s first stop will be the wonderful Blue caves. Your boat will enter into the Blue caves. It is said, according to the legend that in one of the blue caves called Ahai, there was situated the marble palace of Poseidon. The clear blue water into the caves will leave you speechless. Departing from the caves your boat will be soon arriving at the the small but perfectly formed island of Antipaxos, where the sandy blue water coves have been compared to the Caribbean’s. Here you will be able to swim into the crystal blue water of this famous beach, the Paradise Beach. As soon as you are ready to depart from Antipaxos you will be again transferred to your next beautiful destination Paxos island. As your boat enters the picturesque port of Gaios village, you are able to admire the two close islands of Panagia and Agios Nikolaos. At Gaios your boat will moor close the center of Gaios village giving you the opportunity to walk around the narrow streets of the village and enjoy your lunch at one of the traditional tavernas. Upon your request, your mini cruise will come to its end and you will soon be transferred back to the main Port of Corfu island where Vidos Travel, buses will be waiting you to take you back to your Hotel.